Patrick Nguyen, Mihaylo College class of 2007, started a dessert restaurant in Costa Mesa. 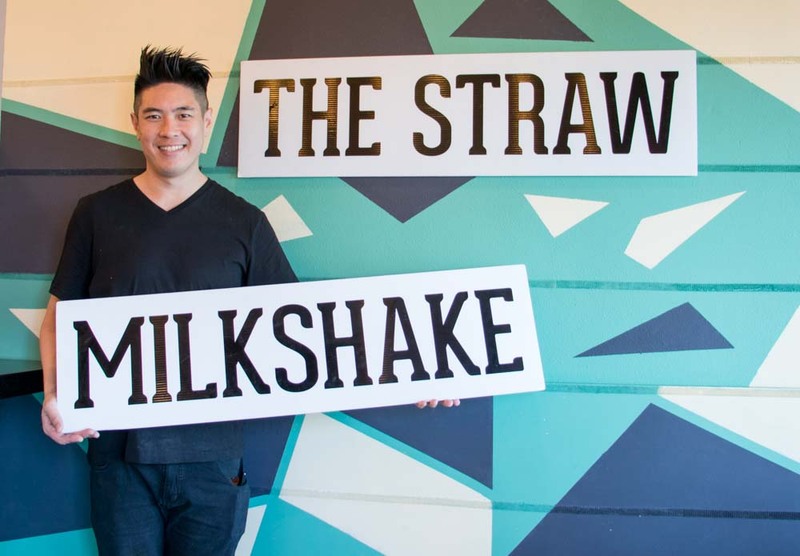 The Straw: Modern Milkshakes recently celebrated its one-year anniversary. In sunny Southern California, there’s never a bad time to enjoy a good milkshake. 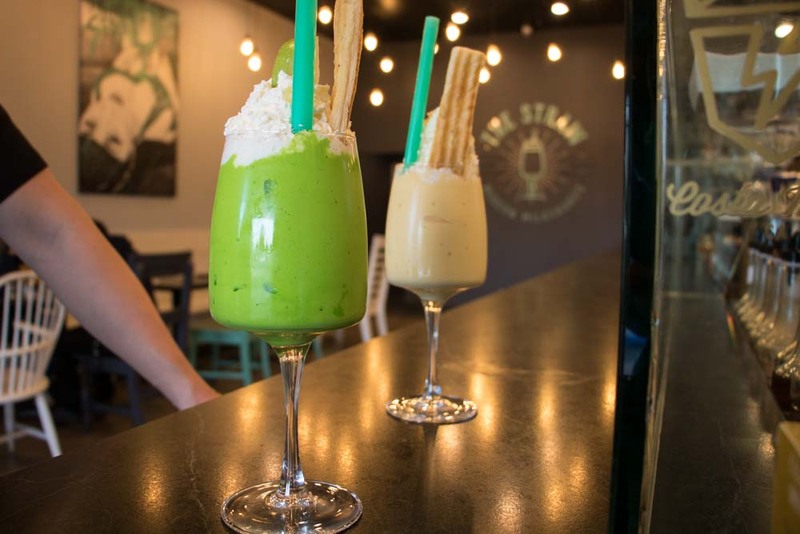 And for dessert fans in Orange County, newly opened The Straw: Modern Milkshakes has quickly become a local hotspot for cool treats. Owned by Patrick Nguyen and his wife, Caroline, the restaurant serves up a creative and modern spin on the classic milkshake parlor. While working toward his degree at Mihaylo, Patrick Nguyen ’07 (marketing) managed his parents’ Vietnamese restaurant in Costa Mesa, an experience that taught him the fundamentals of running a food-service business. In March 2017, after several years of crafting the perfect menu items, Patrick and Caroline Nguyen opened The Straw in a space next door to the family restaurant. We got the chance to talk to Patrick about his unique business. He discusses why he decided to start a milkshake restaurant, his experience in the food-service industry, and how he uses social media to market his business. He even shared with us how and why he decided to create a milkshake with durian – an ingredient that is commonly referred to as the “smelliest fruit in the world”. Here is the inside scoop on The Straw: Modern Milkshakes. At The Straw, extra care is taken to make sure that every milkshake is perfect. Pictured here are the Coco Duran (with special ingredient durian) and the newest menu item. Why did you and your wife start the business? The Straw: Modern Milkshakes is an updated spin on the classic milkshake parlor with fun modern flavors. My wife and I decided to open up our business for a number of reasons: We wanted to create art. We wanted to create something that no one has ever seen. We wanted to make our families proud of us. We wanted to build something that would allow us to make a mark in the restaurant industry. How is running a milkshake/dessert shop different from running a casual restaurant? We don’t run our milkshake parlor any differently than any other casual restaurant. The way we approach and describe our milkshakes is no different than a sommelier describing wines. From the moment the customer arrives at The Straw, they are treated like a customer at a dine-in restaurant. They are greeted by a host and escorted to their table. Our “milkshake artist” will approach the table offering water and describe the menu in full detail about how the milkshakes are made and the flavors the milkshakes embody. Has Yelp been helpful to your business? Yelp is a very helpful tool. As small-business owners, we don’t have a research and development department. It is very difficult to walk around asking people to take surveys. Yelp is a great platform for guests to share their experiences at certain places. All reviews, both negative and positive, can be helpful. It helps business owners understand what customers want and what they don’t want. But the most important thing about Yelp is that it allows customers to read organic reviews by real people. Reviews are trusted more when they come from a familiar source. Your Instagram account is thriving! Does your traction on Instagram translate to new customers? Traction on Instagram drives business very well. It allows us to showcase our products and reach a larger audience. Information is sent faster to more people. If we wanted to create a new milkshake, we could notify a large number of people within minutes versus hours or days. Is there one milkshake that is the clear customer favorite? 1. The Cherry Bomb, a white chocolate milkshake with cherries. 2. Bangkok Betty, a mango sticky rice-inspired milkshake made with mango and coconut milk. 3. Storm, a triple-chocolate shake made with blackberries. 4. La Bella Donna, our take on the classic cookies-and-cream milkshake, but it’s made with a slice of tiramisu blended into the milkshake. What inspired you to mix coconut and durian (the smelliest fruit in the world) and make that into the Coco Duran milkshake? How have your customers reacted to this flavor? Durian is such an amazing fruit. It’s the most unique fruit with its look, smell and taste. I love sharing with people the beauty of my Vietnamese heritage. I love learning about cultures and how everything ties together. Durian has this bad reputation. Not only does it look like something that came from another planet, but it smells like a combination of ammonia, bananas, mango, and pineapple mixed with a bit of rotting onion. The texture is something that is reminiscent of stringy buffalo mozzarella. To me, it tastes like it smells. But I knew if anyone can make durian taste good, it was going to be me. I wanted to reintroduce durian to a new audience. I was confident that I can show our customers the beauty of the fruit. You can ruin the best dish if you don’t use the right ingredients, so I just had to find the right ingredient to add to durian to show people that it isn’t so bad. A lot of Vietnamese desserts have sweetened coconut milk in them, so during the testing phase of the durian milkshake, instead of using milk, we used coconut milk and it was AMAZING. It was durian enough to know that it was durian but not so durian that it was overpowered with durian. We created a perfect balance between durian, coconut and ice cream. It’s the perfect drink to introduce people to durian without the intimidation of the smells and texture. Our customers are very surprised how good our durian coconut milkshake is. People love learning new things. I think that’s also the appeal of it. I’m very proud of our Coco Duran. How have you used what you learned from Mihaylo College in running your business? The Straw is located in Costa Mesa, California. They frequently hosts events like paint night and speed dating. I remember taking a couple of business stat classes. Do I use statistics equations in my everyday life? No. Not at all. But it taught me to be a problem solver. Stats conditioned my mind to find solutions for problems. I struggled with that class. Twice. But it made me a better business person because I finished it. Mihaylo College also taught me how to work with groups of people. In my senior year, I was in a group for a class project. I didn’t particularly like my group. I didn’t get along with any of team members. But frankly, that’s the real world. You’re not always going to like your coworkers, but if you want to keep your job and succeed, you better set aside your differences to accomplish your goals. I was especially fortunate to have marketing professor Christopher Anicich. When I slacked off during his class, he didn’t hesitate to call me out on it. In the real world, there are consequences for your actions. Professor Anicich really set me straight – I will never forget that lesson. What advice do you have for students or anyone looking to open a restaurant? For anyone looking to open a restaurant: SAVE YOUR MONEY! Capital is so important. Pennies have never been so valuable. The restaurant industry is ruthless. Respect the restaurant industry. The moment you don’t respect it, it’ll eat you alive. Be prepared to sleep less. Be prepared to not have a social life until your restaurant succeeds. Success is not something that comes by accident. It comes with hard work. If you don’t have passion for your product, don’t try to sell it. Believe in your product. When you love your product and speak about it, people will believe in it. In a land where foodies are aplenty and Yelpers are ruthless, there’s a lot that goes into opening a restaurant in Orange County. But after years of hard work, saving up, and crafting the perfect menu, Patrick and Caroline opened up The Straw in March 2017. Want to learn more about The Straw: Modern Milkshakes? Check out their website and follow them on Instagram. Like Patrick Nguyen of The Straw, students in the marketing and entrepreneurship programs at Cal State Fullerton are starting up their own businesses every day. Find out more about how the Center for Entrepreneurship at Mihaylo College of Business and Economics supports students and local businesses in their entrepreneurial endeavors.